The gift comes in the same month as a major construction milestone for the project—the completion of all structural steel installation for the innovative and flexible $435 million building, designed by Diller Scofidio + Renfro in collaboration with Rockwell Group. The Shed features a telescoping shell on rails, which will enable the structure to expand or contract to accommodate the needs of a vast range of performance, visual art, events, and multidisciplinary work. The building can physically transform to support artists’ visions and enable collaborations across disciplines under one roof. The artistic program of The Shed has already begun with a free, citywide residency program in dance activism for young people, FlexNYC, in collaboration with Reggie “Regg Roc” Gray and the D.R.E.A.M. Ring (Dance Rules Everything Around Me) flexn dancers. Through flexn, a form of street dance with roots in Jamaican Bruk Up, students explore issues of social justice while developing their capacity to express themselves and confront challenges. With the first year of the FlexNYC program now complete, Poots announced that it will expand later this year to all five boroughs, serving approximately 300 students at 20 sites. In addition to partnering with public schools and New York City Housing Authority community centers, FlexNYC will also begin to partner with the city’s Beacon youth programs to provide after-school activities. The Shed’s commitment to early-career local artists also extends to its creative lab, a dedicated space in the building for experimentation and creative support, which will be accessible year-round, free of charge. Poots also announced that The Shed’s Chief Science and Technology Officer, Kevin Slavin, has begun collaborative projects with faculty and staff at the MIT Media Lab, where he is a Research Affiliate, and through a fellowship program to be developed within the creative lab. These efforts will enable artists to access the latest developments in fields such as virtual reality, synthetic biology, artificial intelligence, and location-based technologies so they can create new ideas and images for our time. According to Slavin, “The mission of The Shed includes taking science and technology out of their isolation as either instrumental to commerce or isolated in academia and into their most meaningful expressions as culture,” a goal that is enabled by the unique and flexible infrastructure of the building. With its variable program and spatial elasticity, The Shed can physically change at will. The building is spontaneous and responsive to myriad artistic ideas. With references to Cedric Price’s unbuilt, “anti-building” of the 1960s, the Fun Palace, the architects’ design for The Shed’s 200,000-square-foot home comprises an eight-level base structure and a telescoping outer shell. The base building holds two expansive, column-free galleries totaling 25,000 square feet of museum-quality space; a 500-seat black-box theater that can be subdivided into even more intimate spaces; event and rehearsal space; and a creative lab that will be provided free to early-career local artists. The telescoping outer shell can be deployed over the adjoining 20,000- square-foot plaza to create a 17,000-square-foot light-, sound-, and temperature-controlled hall that can serve an infinite variety of artists’ needs and uses, including as a theater seating 1,250 people or a standing audience of up to 3,000 people. Its ceiling acts as a theatrical deck, allowing for rigging across the entire volume of space above performers and audiences, as well as light and sound control. When the space is not needed, the shell can nest over the base building, freeing the plaza for outdoor use and programming. Weighing more than 4,000 tons when fully loaded with building systems and production equipment, the movable shell will travel on a double-wheel track based on gantry crane technology commonly found in shipping ports and railway systems. A rack-and-pinion drive will move the shell forward and back on four single-axle and two double-axle bogie wheels that measure six feet in diameter. The deployment of the shell will take five minutes at a maximum speed of a quarter mile per hour, with systems run by secure wireless remote and back-up hardware controls. 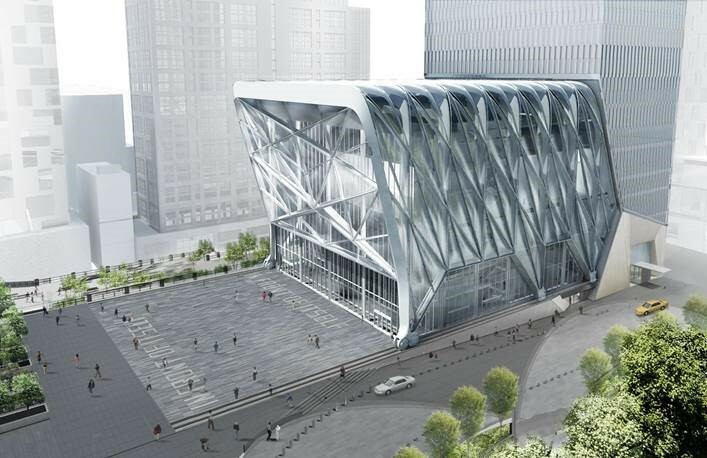 The exposed steel diagrid frame of the movable shell will be clad in translucent pillows of durable and lightweight Teflon-based polymer, called ethylene tetrafluroethylene (ETFE). With the thermal properties of insulating glass at a fraction of the weight, the translucent ETFE will allow light to pass through and can withstand hurricane-force winds. Measuring almost 70 feet in length in some areas, The Shed’s ETFE panels are some of the largest ever produced. Bloomberg Philanthropies works in more than 120 countries around the world to ensure better, longer lives for the greatest number of people. The organization focuses on five key areas for creating lasting change: Arts, Education, Environment, Government Innovation, and Public Health. Bloomberg Philanthropies encompasses all of Michael R. Bloomberg’s charitable activities, including his foundation and his personal giving. In 2016, Bloomberg Philanthropies distributed $600 million. For more information, please visit bloomberg.org or follow Bloomberg Philanthropies on Facebook, Instagram, Snapchat, and Twitter. Opening in spring 2019, The Shed will be New York’s first multi-arts center designed to commission, produce, and present all types of performing arts, visual arts, and popular culture. Driven by experimentation, innovation, and collaboration, The Shed will be a center for artistic invention, bringing together leading artists working in every art form with leading minds in the humanities and sciences. The program will be international, created with co-commissioning partners around the globe, and local, with early-career artists in residence in The Shed’s creative lab. Located on the west side of Manhattan where the High Line meets Hudson Yards, the unique and flexible building can physically transform to support artists’ visions and the work they create—from hip hop to classical music, visual art to literature, film to theater and dance—with collaborations across these disciplines and beyond, all under one roof. For more information, visit theshed.org.